Published March 26, 2010 at 500 × 375 in Art. The dove is representative of myself at a time when I believed in God but was unsure of some teaching that I was learning about Him. I felt afraid and unsure of what was truth. It was at this time that I called out to Jesus in prayer and I had a vision of this. The large hands open wide are representative of Jesus’ hands with His glory as the yellow light radiating out from them. I believe that He was saying to me that it was okay, that He could be trusted, that He loved me and would not hurt me. So it was that I decided not to worry but just to rest in Jesus’ love. 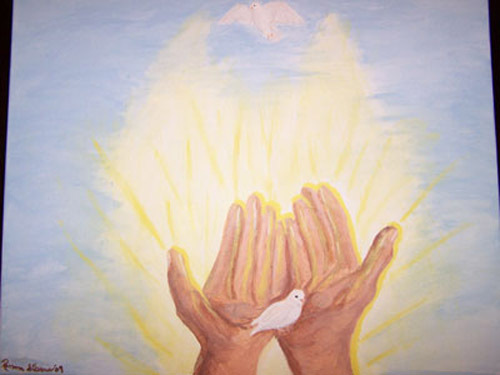 Thus the dove representing myself is at first flying overhead and then as it sees the open hands of Jesus, decides to land there and rest. The white surrounding the hands is in the shape of a heart representing love. There is no love like Jesus’ love. It can always be trusted, and there is no safer place than in the hands of Jesus. A scripture that talks more about the characteristics of His love is I Corinthians 13: 4-7.